Manhattan’s “farm-to-table” restaurants have become so claustrophobically commonplace, they are practically their own cuisine: “American New-age”, “Southeast Asian”, “Asian Fusion”, “Californian”, “Farm-to-table”… the trendy moniker barely sounds like the rigorous ingredient discipline it used to be. The idea of toques only using seasonal produce ripped from the earth this morning, from less than 100 miles away has become SO one hour ago. Don’t get me wrong, I worship the concept, but it’s one thing to be a farm-to-table restaurant, and quite another when the restaurant owns both the farm and the table! 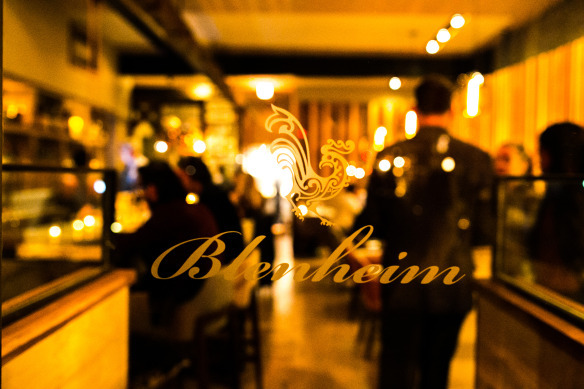 Such is the case at Blenheim, the West Village’s charming conduit for the enjoyment and nourishment of their very own harvest of sustainably grown fresh greens and humanely raised animals. Brainchild of the Smörgas Chef cofounders Morten Sohlberg and his partner Min Ye, their family farm in the Catskills is home to beehives, maple (syrup) trees, a hydroponic greenhouse for year round salads and veggies, dark barrels for mushrooms and a host of rare and heritage breeds of cattle, sheep and pigs. Enter multiple Michelin star honoree, chef Ryan Tate and suddenly you are faced with the best of all possible worlds on the plate in front of you – and I’m just talking about the BUTTER! I could quite easily sit here and write an entire review just about the Blenheim butter (and I would, were it not for all the other star-studded weapons in chef Tate’s arsenal). But if I did, here’s how it would go: Restaurant bread and butter are the most overlooked, unsung heroes to ever exit the kitchen. They are as expected and ubiquitous as the battery-operated flickering candle, the lonely and lifeless nine-day-old stem in a waterless vase, the empty salt and clogged pepper-shaker or that dishwasher-proof, 2nd hand crust on a dull knife. 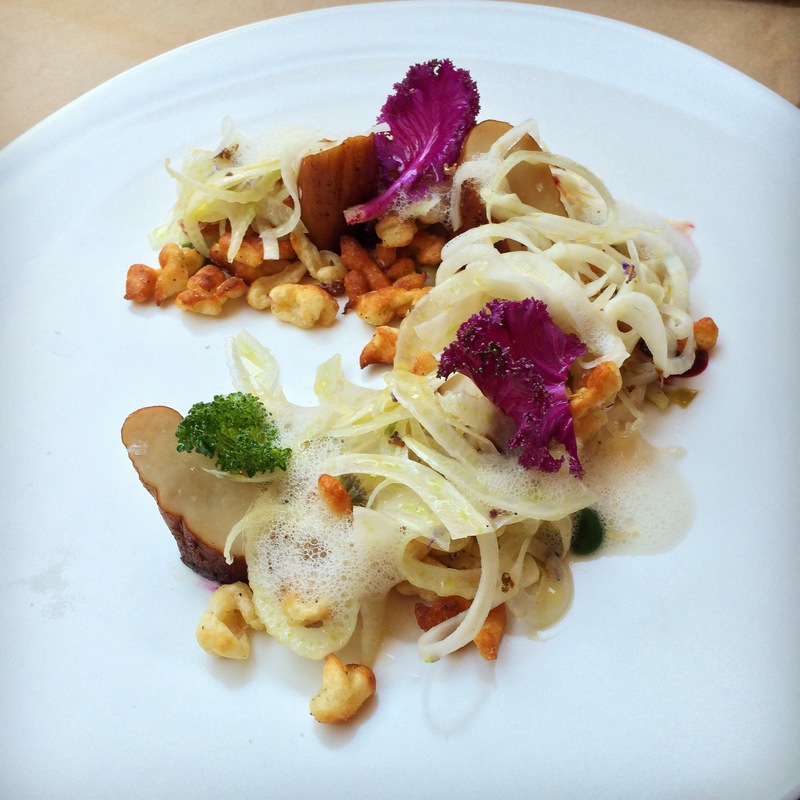 And thanks to the low-carb diet craze, some restaurants wont even bring you bread and butter anymore. So when our waiter gave us the choice of cheddar crusted white or red fife brown dinner rolls, and then placed a jar of what looked like a rich wedge of dark lemon curd topped with coarse chunks of Sel de Mer on the table, we were plausibly beguiled. 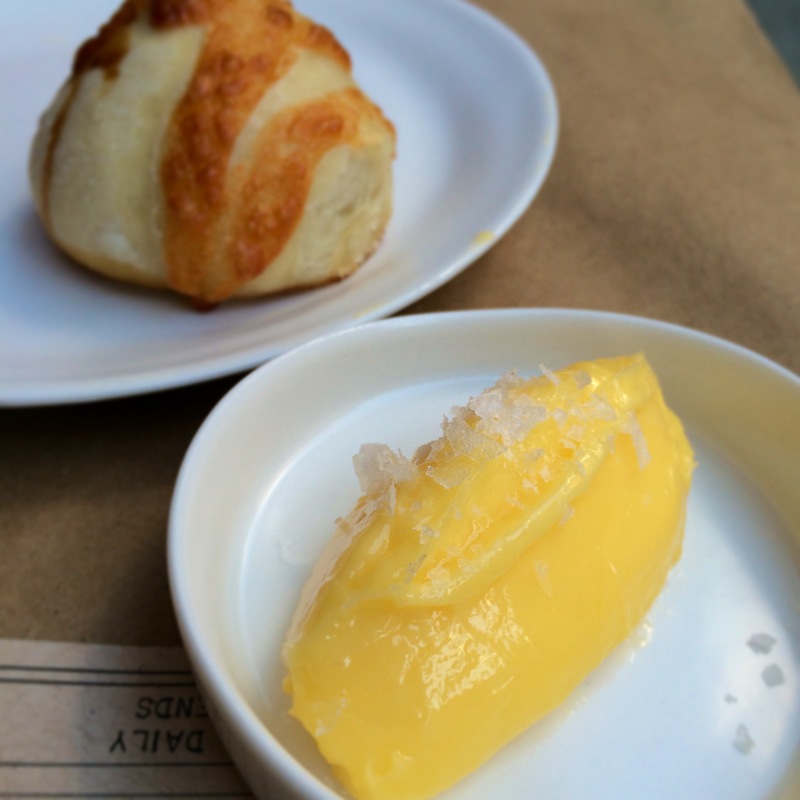 “Is this…butter?” I asked as I tore into a golf-ball-sized cheese puff, covering the exposed bread with a generous smear of the soft and shiny, ochre-colored paste. The modest menu of six app’s and six mains sounded like the ingredients of a farmer’s basket: Cauliflower soup, Roasted beets, Heirloom salad greens. Just reading it felt healthy. As the dishes started arriving, Tate’s signature plating style revealed itself as the Christmas wreath. 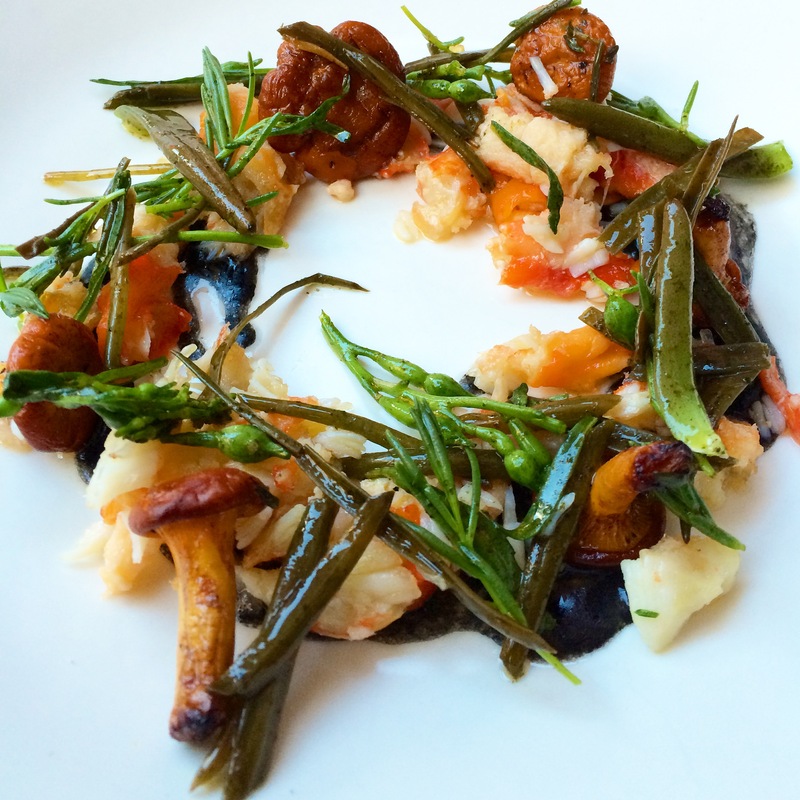 The King crab legs were layered in a carousel of flavor amongst chanterelle mushrooms and an assortment of sea plants on the most deliciously buttery squid ink sauce. 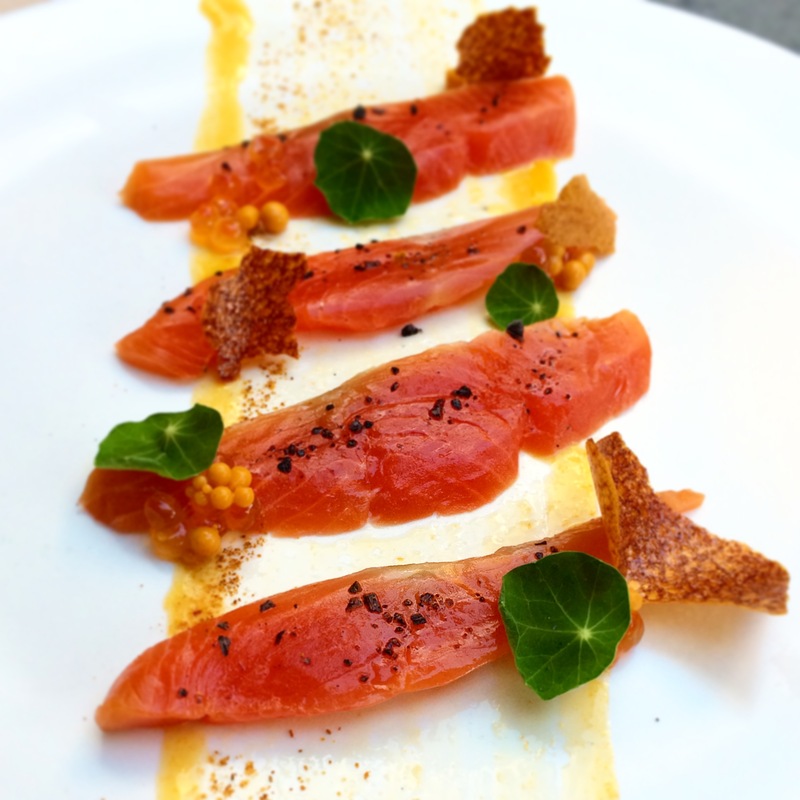 The subtle taste of the cured Sockeye Salmon paired beautifully with the trail of nasturtium blossom puree (a first for me) and sea buckthorn pearls and crisps. The mains covered all bases with a hanger steak, a pork loin, a guinea hen and a couple of fish. The ultra-crispy Striped bass was paired perfectly with coffee-roasted carrots (whole and pureed) and the odd blueberry in a scrumptious sea urchin sabayon sauce. The rich and hearty-as-a-filet-mignon Roasted Trumpet Mushrooms (from the aforementioned dark barrel), were surrounded by a bed of homemade sauerkraut, shaved fennel, and (not nearly enough of) the most wonderfully crispy roasted Spätzle ever. The desserts are an equally interesting blend of farm fresh ingredients with Tate’s personal spin, like buckwheat crêpes and buttermilk sorbets, but the Apricot and Popcorn Crémeux is definitely the highlight. And so if it is indeed true that “you are what you eat”, then go ahead and call me a farm-to-table Blenheimer! Was just there a couple days ago, and also have to say that the bread and butter was out of this world.